Unfortunately, the design and colours of Revolutionary/Napoleonic flags (pavillons, guidons, flammes) are of no help when it comes to getting an idea of the design and colours of the respective arming cloths. Arming cloths decorated with fleurs de lys may well have lasted into the Constitution (as was the case with army flags) but it's very unlikely that they survived the abolition of the monarchy (21 September 1792). BTW, the arrangement of the stripes on the 1790 tricolour differed from the 1794 version. In 1790 the hoist side stripe was red and the fly side stripe blue, while in 1794 it was (and still is today) the other way round. I noticed. Perhaps, some cloths had yellow edges later but wrong perception on the viewer's part or soiling on the painter's part may be more likely options. I'd give the white strips the benefit of the doubt. Hardly a mistake, in my opinion, as it was quite the habit to paint the upper parts of the hull wall in a different/emblematic colour, and certainly not intended to fake or replace arming cloths. As far as I can see arming cloths - of both decorative and, to some extent, protective value -were mainly used to cover open railings, apparently often repeating the paint scheme of the upper walls. Lavish extra decoration of the upper wall with fleurs de lys was no longer the fashion in the later 18th century (and probably deemed too costly as well), so they usually were omitted on the ship's wall but, evidently, not (always) on the arming cloths which, after all, were moveable items, easily stowed and reusable on any vessel. For clarification: The period I'm referring to is the late 18th to the early 19th centuries (in essence, the two last decades of the Ancien Régime, the Revolutionary and Napoleonic eras, the era of the Restauration in France, c. 1770 - c.1830). Are you sure? I think "doppio passo" was the same as the French "pas redoublé", or "pas accéléré", or "pas de manoeuvre", or "pas d'attaque", or "pas de charge" - the latter not to be confused with the step used when the signal "La Charge" was given (all these terms denote a pace from between 100 to 120 steps per minute; exceptionally up to 140 steps per minute for specific light infantry units such as the Légion Corse [according to a 1772 document related to this unit]). In German, this pace is called "Geschwindschritt" or "Doppelierschritt", etc. It was used on the battlefield when large formations marched against the enemy lines, but also quite often on parades, etc. The "pas de course" was a lot faster than the "pas redoublé", etc. Actually, the "pas de course" was used for storming when the signal "La Charge" was given. It was effective only on the last few meters before clashing with the enemy as it was virtually impossible to keep good order within one's own lines over a longer distance. It was also used by light infantry skirmishers. In German, this pace was called "Laufschritt" or "Sturmschritt". "Martinique had overseas departments and Fort-de France likely" ??? Martinique was a French overseas colony (not a department, at the time) itself, and it did not have "overseas departments" but "dependencies" (in essence, the nearby island of Sainte-Lucie). Fort-de-France (ex- Fort Royal) was the capital of Martinique. The governor (with the title of Capitaine général de la Martinique) was Vice-admiral Villaret de Joyeuse. 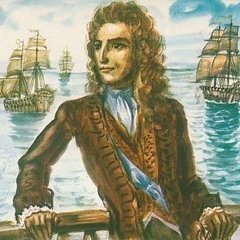 https://en.wikipedia.org/wiki/Louis_Thomas_Villaret_de_Joyeuse Guadeloupe was another French overseas colony whose governor (Capitaine général de la Guadeloupe) was Général de divison Jean Augustin Ernouf. https://en.wikipedia.org/wiki/Jean_Augustin_Ernouf The eastern, i.e. Spanish part of the island of Santo Domingo was under French government only as long as the French-Spanish alliance was in existence and was an improvised undertaking anyway as the French" governor", Général de division Jean-Louis Ferrand, had sought refuge there with the defeated French troops after the failed attempt to reconquest the western part of the island, the former French colony of Sainte-Domingue, now independent Haiti. So, Ferrand was not actually governing a French colony but a Spanish one, tolerated by - or with the enforced (by Napoleon) "consent" of - the Spanish Crown, presumably in anticipation of a possible reconquest of Haiti for France. Logically, his "rule" came to an end when the French-Spanish alliance broke up. https://fr.wikipedia.org/wiki/Jean-Louis_Ferrand As far as I can see, there was no hierarchy among the various French governors (they all received orders directly from the ministry of the navy), so not really a single HQ for the French in the Caribbean but, as a naval station, Fort-deFrance/Martinique certainly was the most important. "Descent to water three ships on the Malta Shipbuilding Yard, May 3 1800." What? Agreed. What we see on the left is the Peter and Paul fortress and cathedral: http://www.goingrussia.com/portfolio-item/peter-and-paul-fortress/?lang=de The Admirality should be on the right? https://www.alamy.de/stockfoto-panorama-admiralitat-winterpalast-einsiedelei-und-peter-und-paul-festung-in-st-petersburg-russland-39296206.html Anyway, it's Saint Petersburg.